In line with the relevant resolutions taken during its sessions held in 2015, 2016, and 2017, the Standing Committee for Economic and Commercial Cooperation (COMCEC) of the Organisation of Islamic Cooperation (OIC) has designated SESRIC as a focal point at the OIC level for following up the SDGs indicator framework. The COMCEC has also tasked SESRIC with identifying the SDGs priorities of the OIC member countries and regular report submissions to its Follow-Up Sessions and Annual Sessions. The Report summarizes the progress recorded at the global level concerning the work on the SDG indicator framework. 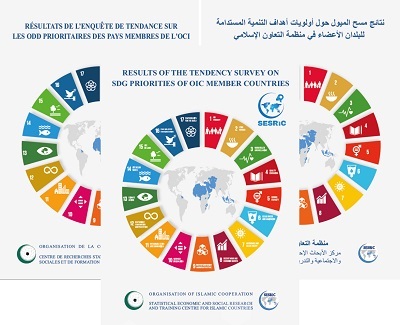 The Report furthermore informs the readers about the SDG priorities of the OIC countries as per the results of the Tendency Survey on SDG Priorities of OIC Member Countries designed, circulated, and collected by SESRIC since 2016 and briefs the readers about the limiting factors for the achievement of SDGs, SDG coordination mechanism and SDG data availability in OIC countries. The Report shows that SDG 1 (No Poverty), SDG 3 (Good Health and Well-being), SDG 2 (Zero Hunger), SDG 4 (Quality Education), SDG 5 (Gender Equality), SDG 8 (Decent Work and Economic Growth), SDG 9 (Industry, Innovation & Infrastructure), SDG 13 (Climate Action) are the prioritised SDGs at the OIC level as per the feedback received from respondent countries. The Report also uncovers that shortage of financial resources is the most salient factor in front of the achievement of SDGs by 2030. Lack of data sources to monitor, evaluate and lack of technological/IT means have also been articulated by respondents as other critical limiting factors concerning the achievement of SDGs by 2030. In this connection, the Report discusses the SDG data availability in OIC countries. Across 244 global indicators, trend analysis is observed to be possible for only 69 indicators (28.3% of the total indicators) with a minimum of two data points available for the SDG indicators for at least 50 per cent of the OIC countries. At the OIC level, the data availability for only SDG 9, SDG 3, SDG 7 and SDG 15 is equal to or more than 50%. It is also observed that for 112 indicators, it is not possible to do either a trend analysis or a situation analysis due to lack of data. Of these 112 SDG indicators, 67 of them are classified as Tier III, 34 of them are Tier II, and 11 of them are Tier I indicators. The Resolution #121 of the 34th Session of the COMCEC took note with appreciation of the Report presented by SESRIC and requested SESRIC to prepare an annual report on the progress at the OIC level towards achieving the aforementioned eight prioritized SDGs to be submitted to the Ministerial Sessions of the COMCEC. The Resolution further requested SESRIC to give special importance to the development of the statistical capacities of the National Statistical Offices of the Member States within the framework of its OIC Statistical Capacity Building Programme (StatCaB).